This week in our series: a sudden change in Washington. The House of Representatives ended the day's business early on the rainy afternoon of April twelfth, nineteen forty-five. The House Democratic leader, Speaker Sam Rayburn, invited a friend to come by his office for a drink. "Be there around five," Rayburn said. "Harry Truman is coming over." Harry Truman was the vice president at the time. The events are described in a book about his presidency, "Conflict and Crisis" by Robert Donovan. World War Two was not over yet. But it was a quiet afternoon in Washington. President Franklin Roosevelt was in the southern state of Georgia. He was resting after his recent trip to Yalta to meet with British Prime Minister Winston Churchill and Soviet leader Josef Stalin. The president's wife, Eleanor, was at the White House, working on a speech supporting the new United Nations. Harry Truman was at the Senate. But he was not interested in the debate that was taking place. He spent most of his time writing to his family back in Missouri. When the debate finished, he went to the office of House leader Rayburn to join him for a drink. Rayburn and his friend were talking in the office before Truman arrived. The telephone rang. It was a call from the White House asking whether Vice President Truman had arrived yet. No, Rayburn replied. The caller asked to have him telephone the White House as soon as he arrived. Truman entered a minute later. He immediately called the White House. As he talked, his face became white. He put down the phone and raced out the door to his car. Truman arrived at the White House within minutes. An assistant took him up to the president's private living area. Eleanor Roosevelt was waiting for him there. "Harry," she said, "the president is dead." Truman was shocked. He asked Mrs. Roosevelt if there was anything he could do to help her. But her reply made clear to him that his own life had suddenly changed. "Is there anything we can do for you?" Mrs. Roosevelt asked the new president. "You are the one in trouble now." Within hours, the world learned the news that Franklin Roosevelt -- the longest serving president in American history -- was dead. He died of a cerebral hemorrhage, bleeding in the brain. Americans were shocked and scared. 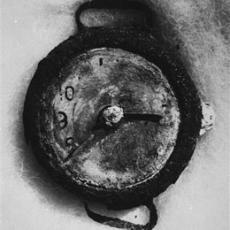 It was nineteen forty-five and the United States was still at war. Roosevelt had led the nation since early nineteen thirty-three. He was the only president many young Americans had ever known. Who would lead them now? All eyes turned to Harry Truman. HARRY TRUMAN: "Our departed leader never looked backward. He looked forward and moved forward. That is what he would want us to do. That is what America will do." Harry Truman in his first speech to Congress as president. "I want in turn to assure my fellow Americans and all of those who love peace and liberty throughout the world that I will support and defend those ideals with all my strength and all my heart." Truman had been a surprise choice for vice president at the Democratic Party nominating convention in nineteen forty-four. Delegates considered several other candidates before they chose him as Roosevelt's running mate. That was at a time when presidential candidates did not make their own choices for vice president. 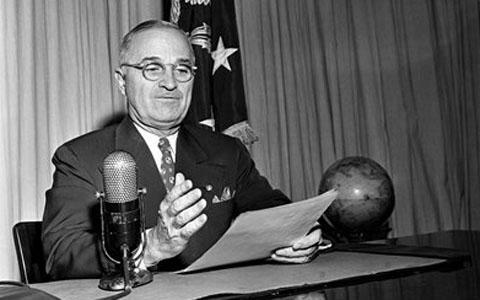 Harry Truman lacked the fame, the rich family and the strong speech-making skills of Franklin Roosevelt. He was a much simpler man. He grew up in the Midwestern state of Missouri. Truman only studied through high school but took some nighttime law school classes. He worked for many years as a farmer and a small businessman, but without much success. Truman had long been interested in politics. When he was almost forty, he finally won several low-level positions in his home state. By nineteen thirty-four, he was popular enough in Missouri to be nominated and elected to the United States Senate. And he won re-election six years later. Most Americans, however, knew little about Harry Truman when he became president. They knew he had close ties to the Democratic Party political machine in his home state. But they had also heard that he was a very honest man. They could see that Truman had strongly supported President Roosevelt's New Deal programs. But they could not be sure what kind of president Truman would become. History gave Truman little time to learn about his new job. The most important power he now possessed was the power of atomic weapons. And soon after he became president, he faced the decision of whether or not to use that power for the first time in history. Truman firmly believed that using the atomic bomb was the only way to force Japan to surrender. So in August of nineteen forty-five, he gave the orders to drop the atomic bombs on the Japanese cities of Hiroshima and Nagasaki. HARRY TRUMAN: "Having found the atomic bomb we have used it. We shall continue to use it until we completely destroy Japan's power to make war. Only a Japanese surrender will stop us. 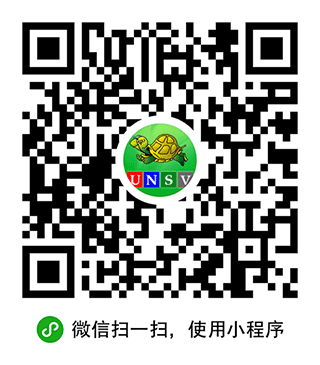 It is an awful responsibility which has come to us. We thank God that it has come to us, instead of to our enemies. And we pray that he may guide us to use it in his ways, and for his purposes." 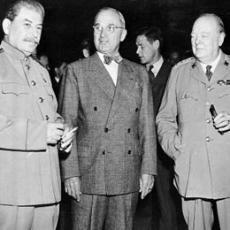 Days earlier, Truman had met in Potsdam, Germany, near Berlin, with the British and Soviet leaders, Winston Churchill and Josef Stalin, to plan the peace. The war in Europe had ended several months before. NEWS ANNOUNCER: "Good evening, from the White House in Washington. Ladies and gentlemen, the president of the United States." HARRY TRUMAN: "My fellow Americans, I have just returned from Berlin, the city from which the Germans intended to rule the world. It is a ghost city. The buildings are in ruins, its economy and its people are in ruins. "Our party also visited what is left of Frankfurt and Darmstadt. We flew over the remains of Kassel, Magdeburg and other devastated cities. German women and children and old men were wandering over the highways, returning to bombed-out homes or leaving bombed out cities, searching for food and shelter. "War has indeed come home to Germany and to the German people. It has come home in all the frightfulness with which the German leaders started and waged it." The three leaders agreed that their nations and France would jointly occupy Germany. They also agreed to end the Nazi party in Germany, to hold trials for Nazi war criminals and to break up some German businesses. Foreign ministers of the Allied nations later negotiated peace treaties with Germany and other countries including Italy, Hungary and Romania. Eastern European nations agreed to protect the political and economic freedom of their citizens. However, western political experts were increasingly worried that the Soviet Union would block any effort for real democracy in eastern Europe. Truman did not trust the Soviets. And as he made plans for Asia, he promised himself that he would not allow Moscow any part in controlling Japan. The leader of the American occupation in Japan was Army General Douglas MacArthur. MacArthur acted quickly to hold a series of trials for Japanese war crimes. He also launched a series of reforms to move Japan toward becoming more like a Western democracy. Women were given the right to vote. Land was divided among farmers. The idea of a national religion was ended. And the educational system was reorganized. Japan began to recover, becoming stronger than ever as an economic power. Truman and other world leaders were dealing with the problems of making peace. But at the same time they also were trying to establish a new system for keeping the peace. The United States, the Soviet Union, Britain and the other Allies had formed the United Nations during wartime. But soon after Truman took office, they met in San Francisco to discuss ways to make the United Nations a permanent organization for peace. In July of nineteen forty-four, many of the world's top economic experts met to organize a new system for the world economy. They gathered at a hotel in Bretton Woods in the American state of New Hampshire. They created the World Bank and the International Monetary Fund to help nations rebuild their economies. At the center of all the action was Harry Truman. It was not long before he showed Americans and the world that he had the ability to be a good president. He was honest, strong and willing to make decisions. "I was sworn-in one night and the next morning I had to get right to the job at hand," Truman remembered years later. In an oral history recorded with the writer Merle Miller, Truman said: "I was afraid. But, of course, I didn't let anybody know that. And I knew that I would not be called on to do anything that I was not able to do. That's something I learned from reading history. Truman spoke of how people in the past had much bigger problems. Somehow, he said, the best of them just went ahead and did what they had to do. And they usually did all right. In the coming weeks, we'll discuss how America's thirty-third president moved toward rebuilding a Europe devastated by war. This program was adapted from a script written by David Jarmul. You can find our series online with transcripts, MP3s, podcasts and pictures at www.unsv.com. You can also follow us on Facebook and Twitter at VOA Learning English. I'm Steve Ember, inviting you to join us again next week for THE MAKING OF A NATION -- American history in VOA Special English. This was program #199. For earlier programs, type "Making of a Nation" in quotation marks in the search box at the top of the page.